Three women: a queen, fragile of body and mind. Her confidante, advisor and lover, ready to do what it takes to protect her monarch and her country – however much pain it will cause. And then there’s the social climber who, willing to do anything so she’s no longer a victim, tears them apart. Add nonsensical social rules, wanton psychological cruelty, hilariously strange dancing and lobster references, and yup: we’re in Lanthimos Country. Back in 2013, if you liked your crime to be character-driven, if you were keen on small towns whose idyllic surface belies the darkness below, if you were looking for something altogether less surreal and more British than Twin Peaks, then Broadchurch was a good option. The series wasn’t novel in its plot or themes, but it delivered its tale of a small community being brought to the breaking point by a horrible crime with honesty, sensitivity and the kind of cast that would make grown men weep. So how do you ruin a series that was rightly lauded as excellent and, more importantly, that told a complete story? You make a second series that is badly plotted and that signals its pointlessness at every twist and turn. And yes, it did make grown men weep. Will The Returned Return Again? Sometimes the end should be the end. Some stories should remain concluded. There’s a reason why revenants are creepy, and TV land is full of evidence for this. No, I’m not talking about existential French horror – I’m talking about ITV’s Broadchurch, which came to its second end this week, though with a promise of more. The first season of Broadchurch was nearly perfect in terms of what it was aiming for. Certainly the cast was one of the things going for it, but more than that it had a theme it committed to, and practically everything served that theme: the slow unravelling of a microcosm – a family, a community – due to a horrific deed. It’s not the most original of themes, granted, but Broadchurch handled it smartly and with honesty and the seriousness it called for. It stumbled towards the end, but it nevertheless ended up one of the most poignant British TV series in recent years, and definitely more consistently strong than the BBC’s uneven output in quite a while. Obviously it was tempting to bring back that world, those characters and especially those actors for a second series. 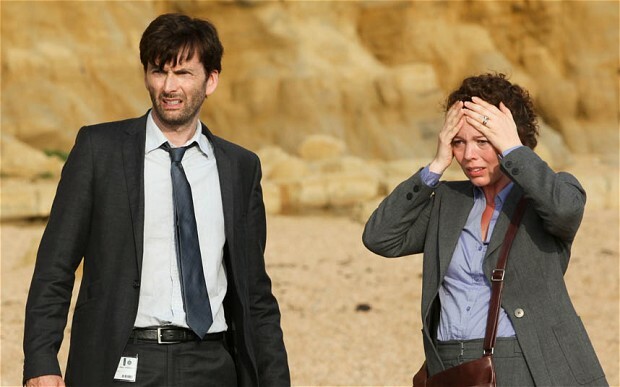 A large part of what made Broadchurch so enjoyable was the David Tennant/Olivia Colman team-up; who wouldn’t go giddy at the chance of watching them for another eight episodes? Except that way lies fan service, which rarely makes for compelling storytelling. Broadchurch went into its second season with a proven cast of characters and actors that were enjoyable to watch the first time round, and there were enough story strands to pick up – but obviously no driving idea, no theme, that would give the continuation the sense that this is a story that has something to say. In fact, series 2 never felt like they started with anything other than the decision to do a second series, much to its detriment. The whole thing reeked of desperation and last-minute panic, resulting in a story that felt made up from one week to the next on the basis of some shaky brainstorming. What if DI Hardy had one of the people involved in his previous, failed case hidden away in a cottage in Broadchurch? What if that Susan Wright woman comes back to wreak ineffectual revenge against her estranged son, repeating what we already had in the first series? What if we got Charlotte Rampling but had no idea how to use her in an interesting way, so let’s say her character goes blind, her mother dies and she’s a closeted lesbian? One of the what-ifs had more potential: what if Joe Miller, the man who turned out to be the killer in the first series, pleaded “not guilty”? What would this do to the community and to the family left behind? What goes on in a man who is culpable but desperately wants himself to be proclaimed innocent of the crimes he’s committed? Instead, this was wasted as we didn’t get character-driven drama so much as badly written courtroom melodrama with characters that wished they had even a second dimension. And we spent so much time with the underwritten dramatis personae of Sandbrook, Hardy’s previous case and a whodunnit that it was difficult to care about. The murder that launched the first series was meaningful, because it was specific: the victim mattered, the murderer mattered, because it was all about bringing a community close to its breaking point. Sandbrook, on the other hand, happened far away and could have been any case, really. 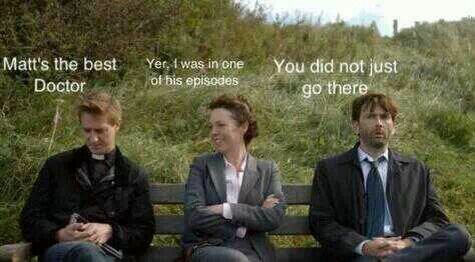 It was irrelevant to Broadchurch. There were attempts at connecting the two cases in terms of themes and motifs, but they were half-hearted and ineffectual to the point of being a nuisance rather than an asset. The first series of Broadchurch still stands as graceful, moving TV, and a wasted second series doesn’t change that much. However, it doesn’t exactly fill me with happy anticipation to see, at the end of the final credits, the caption “Broadchurch will return”. Do they have a story worth telling? Or do they simply have a great cast in need of work and the hope that people will tune in on the strength of the original series? Do the makers of Broadchurch even have a clue what made the series work in the first place? I don’t think so, and no number of scenes with Tennant and Colman acting the hell out of a leaden script will make for a strong reason why Broadchurch needed to continue. In fact, if a third series of Broadchurch is made and ends up as utterly superfluous as the second one, I’ll personally go and beat up the people responsible with my box sets of the fourth season of Deadwood and my 14-disk Complete Firefly. You can find my previous comments on the second series of Broadchurch here.